Coursera today announced Specializations, a new type of certificate program that allows students to follow university-led tracks and develop mastery in a particular subject. The startup says it’s like “a real-world major with immediate applications” to your long-term education and career. The program was developed in close partnership with top universities and professors, but that’s not unique to Coursera. The twist is that the Specializations will go beyond one course, offering multi-course series in cutting-edge fields such as Android development, cybersecurity, data science, music, and teaching. Best of all, many include a capstone project to give students a chance to apply and assess their learning in real-world situations. Students who complete the series will receive a Specialization Certificate to verify their mastery in the basics of the given academic subject. 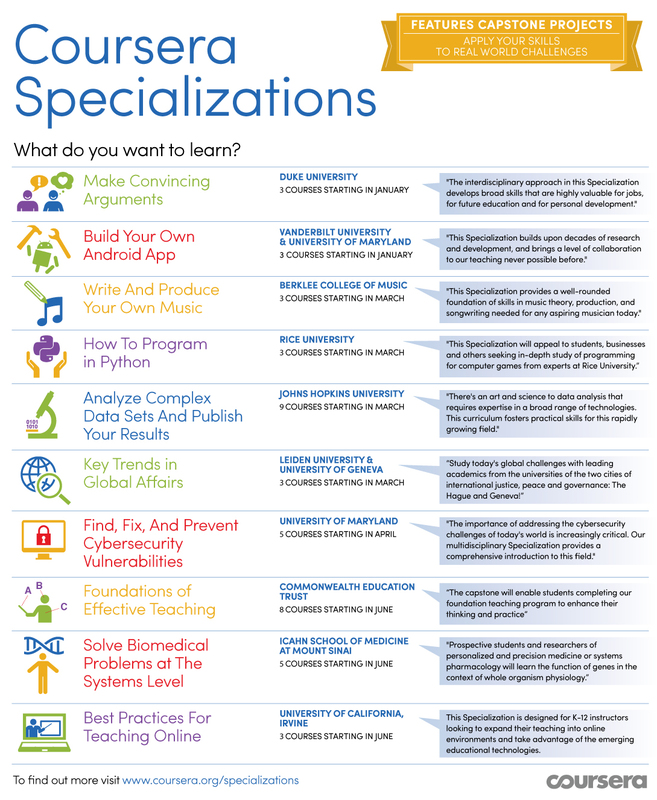 Coursera plans to launch an initial 10 Specializations over the next few months. Two of them — Programming Mobile Cloud Computing Applications with Android (from Vanderbilt and the University of Maryland) and Reasoning, Data Analysis, and Writing (from Duke University) are already open to enrollment. Berklee College of Music: Modern Musician. Commonwealth Education Trust: Foundations of Teaching for Learning. Icahn School of Medicine at Mount Sinai: Systems Biology. Johns Hopkins University: Data Science. Leiden University and University of Geneva: Challenges in Global Affairs. Rice University: Fundamentals of Computing. University of California, Irvine: Virtual Instruction. University of Maryland: Introduction to Cybersecurity.